SET OF 5 MICRON SEDIMENT FILTER AND CARBON BLOCK FILTER REPLACEMENT FOR REVERSE OSMOSIS SYSTEM. 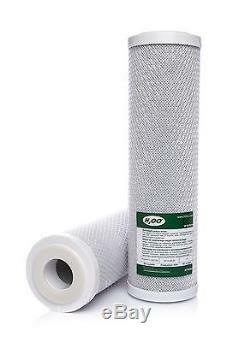 This listing is for 1 x 5 micron sediment filter size 10 PLUS 1 x CARBON BLOCK FILTER FOR REVERSE OSMOSIS UNITS that will fits all standard housing of reverse osmosis systems. Suitable for both drinking and aquarium filters! Please scroll down to see description of each filter and how do we send our product to avoid any damage due a transport to meet best standard and great price. 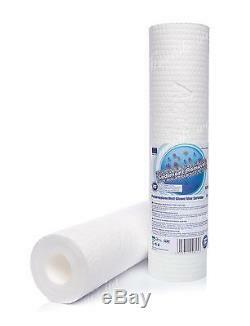 This 1 x 5 micron sediment cartridge is made of polypropylene yarn (FDA compliant). They remove sediment such as sand, silt, rust and suspended solidsCartridges are dedicated for cold water filtration. Working temperture: 2C - 65C. Longevity: 3 - 6 months (depending on the feed water quality). Please find full description below....... 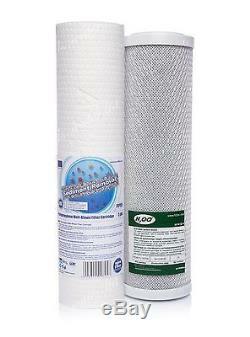 This 1 x carbon block filter is composed of high performance carbon that removes free chlorine, odor, organic contaminants, pesticides and chemicals that contributed to taste and odor also it does improve taste and aroma of filtered water. Working temperature: 2C - 55C. Longevity: 3 - 6 months (depending on feed water quality). (An example of how we will send your parcel). For Highlands, Channel Islands and Northern Ireland. > AB31 to AB38 > AB40 to AB56 > IV1 to IV28 > IV30 to IV32 > IV36 to IV40 > IV41 to IV49 > IV51 to IV56 > IV63 > KW1 to KW17 > PA20 to PA38 > PA41 to PA49 > PA60 to PA78. > PH4 to PH44 > PH49 to PH50 > PO30 to PO41 > TR21 to TR26 > Channel Islands > Isle of Man > Isle of Wight > Northern Ireland (BT) > HS > ZE > JE > GY. This will be free of charge 24h or 48h service excluding Saturday-Sunday and Bank holidays (charges for above postcodes will be added automatically at the time of your check out). The item "SET OF 5 MICRON SEDIMENT FILTER 10AND CARBON BLOCKREVERSE OSMOSISREPLACEMENT" is in sale since Friday, January 29, 2016. This item is in the category "Home, Furniture & DIY\Appliances\Small Kitchen Appliances\Water Filters".ltd" and is located in purfleet, Essex.